Apart from the various conventional herbs, we also have a wide range of products which are certified organic under USDA (NOP) and India Organic (NPOP) and EU Organic Standards. All these herbs are available in whole, Powder, and TBC (Tea Bag Cut) form. Our Organic Certified Herbs are highly demanded and used in various industries for healthcare product formulations. We use only premium quality Arjuna Bark to make our Arjuna Powder. Our Arjuna Powder is certified organic under USDA NOP, India Organic NPOP and EU Organic Standards. This powder is developed from the high-quality bark of Terminalia arjuna tree. Barks are warily washed and dried at low temperature. Offered powder contain rich phytonutrients, antioxidants, and amino acids. The Arjuna barks are not dried using blowers or any heat emitting machines at any stage of the processing. Our organic Arjuna powder is widely used by various supplement manufacturers for making capsules, tablets and churnas. Backed by our years of industry experience, we are betrothed in presenting an excellent quality of Organic Turmeric Powder (Curcuma Longa) with USDA NOP and India Organic NOP Standards. Our Organic Turmeric has a very high curcumin content, which makes it the highest demanded Health Supplement in the world. To preserve the natural nutrients of the Organic Turmeric Roots, the complete process is taken through a careful state of the indulgence. This powder is developed from Dried Roots of Organic Turmeric. These Roots are warily washed and dried under shade. 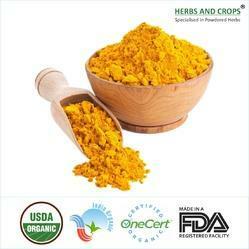 Offered Organic Turmeric Powder contains high vitamins, phytonutrients, antioxidants, and amino acids. We are one of the choicest Exporters of Organic Turmeric Powder in the global market. This variety of Turmeric is basically an Organic Turmeric Root which has been obtained from the Ginger plant family. Benefits for the Skin: Ayurvedic healers and other practitioners of traditional medicine have used both fresh and ground turmeric to treat some skin conditions, including acne and psoriasis. Anti-Cancer Effects: Organic Turmeric may also be one of the best cancer-fighting foods. Both in vitro and animal studies have shown curcumin to possess wide-ranging anti-cancer activity. Our Organic Amla Powder is made by organically processing and drying the organic amla fruits as per USDA Organic Standards of NOP and India Organic NPOP. 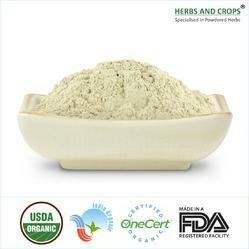 Organic Amla Powder is made by careful processing, drying, pulverizing and sieving the 100% Organic Powder. Its free from any time of pesticides residue or chemical substance. 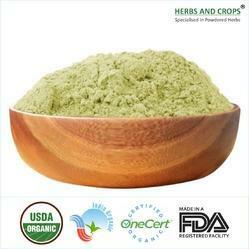 Our Organic Amla Powder can be used for making Amla Juice, Shake, Smoothies, and flavoring. It is also the most suitable quality for various health product formulation as per Ayurveda. Its richness in vitamin C and antioxidants makes it one of the best digestive supplement. OurOrganic Aritha Powder, also known as Organic Soap Nut Powderis made from organically grown and cultivated Soap Nuts. The whole production process is certified organic under USDA (NOP) and India Organic (NPOP) Standards. Organic Sap Nut Powderis made by careful processing, drying, pulverizing and sieving the 100% Organic Aritha. Its free from any time of pesticides residue or chemical substance. Our Organic Aloe Vera Powder can be used for making various personal care (cosmetic) product formulations related to hair. We are among the most prominent supplier and exporter of Certified Organic Aritha Powder and other related products from India. We are one of the major manufacturer and exporter of Organic Ashoka powder from India. We use only premium quality Ashoka Bark to make our Ashoka Powder. Our Ashoka Powder is certified organic under USDA NOP, India Organic NPOP and EU Organic Standards. To preserve the natural nutrients of the herb, the complete process is taken through a carefully state of the indulgence. This powder is developed from high quality bark of SARACA INDICA tree. Barks are warily washed and dried at low temperature. Offered powder contain rich phyto nutrients, antioxidants, and amino acids. Our organic Ashoka powder is widely used by various supplement manufacturers for making capsules, tablets and churnas. OurOrganic Brahmi Powder is made from Bacopa Monnieri Plant Leaves and Roots. Its also known as Jal Brahmi. 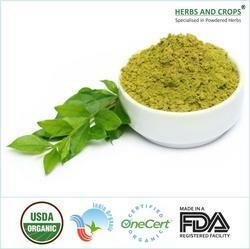 Our Organic Brahmi Powderis made by organically processing and drying theorganic brahmi leavesas per USDA Organic Standards of NOP and India Organic NPOP.Organic Brahmi Powderis made by careful processing, drying, pulverizing and sieving the 100% Organic Powder. Its free from any time of pesticides residue or chemical substance. Our Organic Brahmi Powder can be used for making various health products for stress and nerves system as per Ayurveda.Its richness in Bacocides contenthelps to calm the stressed mind. Apart from its various application as health supplement, it is also used in various personal care (cosmetic) product formulations related to hair as it helps in controlling hairfall and premature greying due to stress. 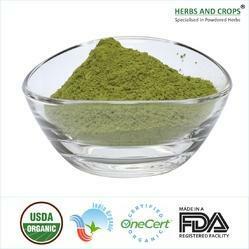 We are among the most prominent supplier and exporter of Certified Organic Brahmi Powder and other related products. OurOrganic Cinnamon Powderis made by organically processing and drying the Organic Cylon Cinnamon Bark , also known as Real Cinnamon as per USDA Organic Standards of NOP and India Organic NPOP.Organic Cinnamon Powderis made by careful processing, drying, pulverizing and sieving the 100% Organic Powder. Its free from any time of pesticides residue or chemical substance. 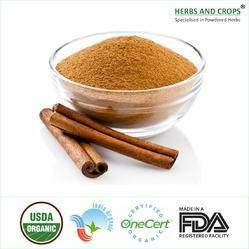 OurOrganic Cinnamon Powdercan be used for making Cinnamon Bakes, Cookies, Cinnamon Bread, Churros, and various other food items. Its savoury taste makes it one of the most used spice in the all cuisines. It is also the most suitable quality for various health product formulation as per Ayurveda. Its richness in antioxidants makes it one of the best supplement for weight loss. We are among the most prominent supplier and exporter of CertifiedOrganic Cinnamon Powderand other related products. Storing Instruction Store in cool and dry place, away from moisture and direct sunlight. 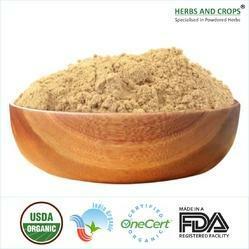 OurOrganic Fenugreek Powder is made from seeds of Fenugreek. Its also known as Methi Powder. Our Organic Fenugreek Powderis made by organically processing and drying theorganic fenugreek seeds as per USDA Organic Standards of NOP and India Organic NPOP.Organic Fenugreek Powderis made by careful processing, drying, pulverizing and sieving the 100% Organic Powder. Its free from any time of pesticides residue or chemical substance. Our Organic Fenugreek Powder can be used for making various health products for digestion system and diabetes as per Ayurveda.Its richness in antioxidants helps with various health issues . Apart from its various application as health supplement, it is also used in various personal care (cosmetic) product formulations related to hair as it helps in controlling hairfall and premature greying. We are among the most prominent supplier and exporter of Certified Organic Fenugreek Powder and other related products. OurOrganic Ginger Powderis made by organically processing and drying the Organic Ginger Roots, also known as Adrakh as per USDA Organic Standards of NOP and India Organic NPOP. Organic Ginger Powderis made by careful processing, drying, pulverizing and sieving the 100% Organic Powder. Its free from any time of pesticides residue or chemical substance. OurOrganic Ginger Powdercan be used for making Bakes, Cookies, Chutnys , and various other food items. Its savoury taste makes it one of the most used spice in Asian Delicacies. It is also the most suitable quality for various health product formulation as per Ayurveda. We are among the most prominent supplier and exporter of CertifiedOrganic Ginger Powderand other related products. OurOrganic Haritaki Powderis made by organically processing and drying the organic Haritaki Fruits (Terminalia Chebula) as per USDA Organic Standards of NOP and India Organic NPOP. Organic Haritaki Powderis made by careful processing, drying, pulverizing and sieving the 100% Organic Powder. Its free from any time of pesticides residue or chemical substance. OurOrganic Haritaki Powdercan be used for making various health product formulation as per Ayurveda. Its richness in tannins and antioxidants makes it one of the best digestive supplement. We are among the most prominent supplier and exporter of CertifiedOrganic Haritaki Powderand other related products. Our Gokharu Powder is certified organic under USDA NOP, India Organic NPOP and EU Organic Standards. To preserve the natural nutrients of the herb, the complete process is taken through a careful state of the indulgence. This powder is developed from high-quality Gokharu Fruits (Tribulus Terrestris). These roots are warily washed and dried at low temperature. 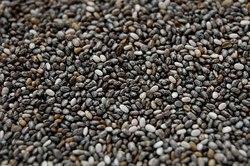 Offered powder rich phytonutrients, antioxidants, and amino acids. The fruits are not dried using blowers or any heat emitting machines at any stage of the processing. Our organic gokharu powder is widely used by various supplement manufacturers for making capsules, tablets and churnas. Storage Type Store in cool and dry place, away from moisture and direct sunlight. OurOrganic Gotu Kola Powder is made from Centella Asiatica Plant Leaves. Its also known as Mandukaparni. Our Organic Gotu Kola Powderis made by organically processing and drying theorganic gotu kola leavesas per USDA Organic Standards of NOP and India Organic NPOP. Organic Gotu Kola Powderis made by careful processing, drying, pulverizing and sieving the 100% Organic Powder. Its free from any time of pesticides residue or chemical substance. Our Organic Gotu Kola Powder can be used for making various health products for stress and nerves system as per Ayurveda.Its richness in Bacocides contenthelps to calm the stressed mind. Apart from its various application as health supplement, it is also used in various personal care (cosmetic) product formulations related to hair as it helps in controlling hairfall and premature greying due to stress. 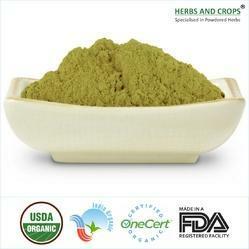 We are among the most prominent supplier and exporter of Certified Organic Gotu Kola Powder and other related products. Backed by our years of industry experience, we are betrothed in presenting an excellent quality of USDA Organic Moringa Powder. To preserve the natural nutrients of the leaves, the complete process is taken through a careful state of the indulgence. This powder is developed from Moringa leaves. These leaves are warily washed and dried at low temperature. Offered leaves contain high vitamins, phytonutrients, antioxidants, and amino acids. The leaves are not dried using blowers or any heat emitting machines at any stage of the processing. With an aim to fulfill the varied requirements of our valued clients, we are engaged in offering USDA Organic Henna Powder. At our Ayurvedic medicine and herbs processing unit, we develop various kinds of henna powder. This help clients develop their own require henna powder accordingly. According to the color, texture, and length of the hair; clients can process their own style and required Henna effortlessly. Our Ayurvedic pharmacists make the powder by applying traditional and pure methods for processing the offered product. No preservative or chemicals are used during the process. Easy to apply and highly effective. Our Organic Aloe Vera Leaves Powder is made by organically processing and drying the organic Aloe Vera Leaves as per USDA Organic Standards of NOP and India Organic NPOP. Organic Aloe vera Powder is made by careful processing, drying, pulverizing and sieving the 100% Organic Powder. Its free from any time of pesticides residue or chemical substance. Our Organic Aloe Vera Powder can be used for making Aloe Vera Juice, Shakes and Smoothies. It is also the most suitable quality for various health product formulation as per Ayurveda. Apart from its various application as food and health supplement, it is also used in various personal care (cosmetic) product formulations related to skin and hair. Looking for “Certified Organic Product”?